Henhouses converted to boatshops are part of West Coast boatbuilding lore. When I think about notable chicken coop artists, a few prominent names come to mind: Bill Lee of Santa Cruz Yachts, protagonist of ULDB sleds; Dave Livingston of Ranger Tug fame; and Russell Brown, the founder of Port Townsend Watercraft, purveyor of polished kits for small plywood boats that DIY owners build in the stitch-and-glue method, such as the PT Skiff or the PT 11 nesting dinghy. (See “Outside the Box,” Professional BoatBuilder No. 130, and the review of Brown’s book Epoxy Basics in PBB No. 150, page 77.) Seeing these boats up close in their finished state, there is much to admire, including small, nearly whimsical hardware pieces made of carbon fiber, which look incredibly slick. Russell Brown inspects the leg of the pedal drive he built for his Gougeon 32 (9.8m) catamaran. The leg was laminated on a hand-shaped, tapered, and Teflon-covered mandrel. 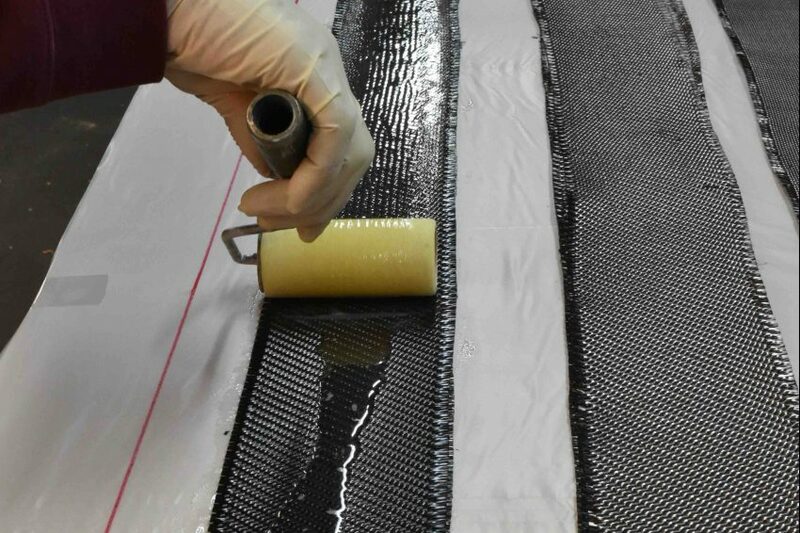 A mix of unidirectional and braided carbon sleeve, the laminate was vacuum-bagged in three separate steps. My interest in composite hardware is rooted in economic reasons. I needed custom fittings, such as goosenecks, tiller head fittings, and rudder gudgeons but could not afford retail prices. So, making these parts from epoxy, fiberglass, and carbon fiber was primarily a practical solution that helped me get back on the water, but the skills I developed in the process and the need to make a living led to making some of these parts in a production setting. In other words, what started as a personal project taught me how to make composite hardware that has value to others as well. The two parts I now produce in quantity are extremely simple but were not commercially available to do the specific jobs I required. They are made from long blanks using compression molding before being cut into individual parts using either a tablesaw or a CNC machine. 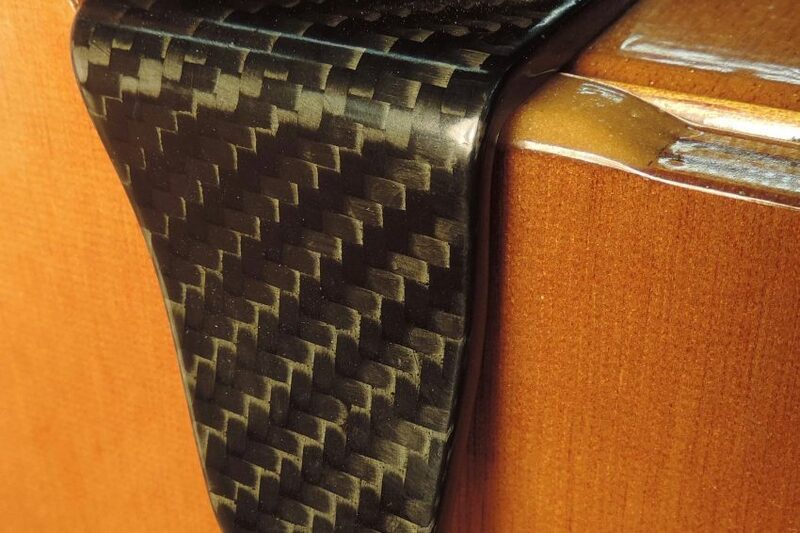 The first example is carbon eye straps, developed because they can be glued on and don’t require fasteners. 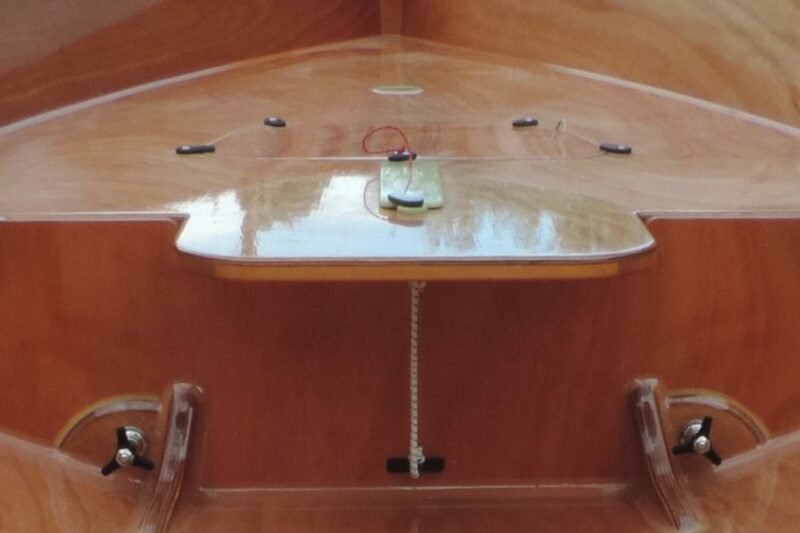 Without them, tie points on the insides of our thin-skinned plywood kit boats would require through-bolting. Next, we take a look at the alignment clips for our kit nesting dinghies. They are essential for precisely aligning the two halves of the dinghy so they can be pulled tightly together with threaded pins. The shape of these clips is critical to their function. Brown uses these Gucci-looking glue-on eye straps in places where through-bolting or installing them with fasteners is difficult or impractical. When I started building these parts, I was vacuum-bagging laminate over simple male molds, but quickly progressed to compression-molding, where the wet laminate is clamped between upper and lower molds. There are three distinct advantages to the compression-molding technique: First, the finished blank is smooth and fair on both sides. Second, clamping the molds for pressure takes less time. And lastly, it produces less waste than vacuum-bagging. While the technology required to make these parts is very basic, the mold geometry can be challenging, because the inner and outer molds are offset by the thickness of the finished blank. Originally, all our parts were constructed in molds made with basic shop tools, because low-budget molds can be surprisingly effective for making large numbers of parts. 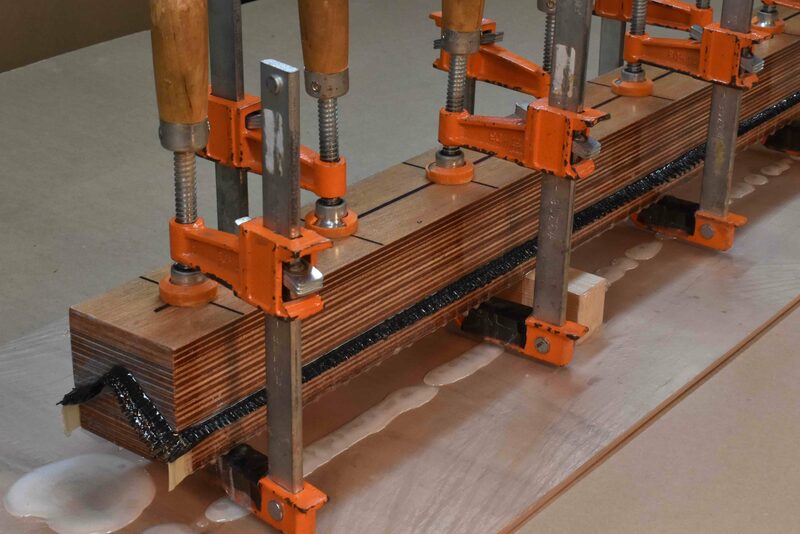 The molds for double eye straps—which are used in the PT Skiff, our kit motorboat, for holding the engine-control cables to the hull side—were made using wood blanks, a router table, and dowels before being finished with epoxy. For the single eye straps, we originally used wood molds but upgraded to CNC-machined molds made from Richlite, a laminated countertop material composed of resin-infused paper. 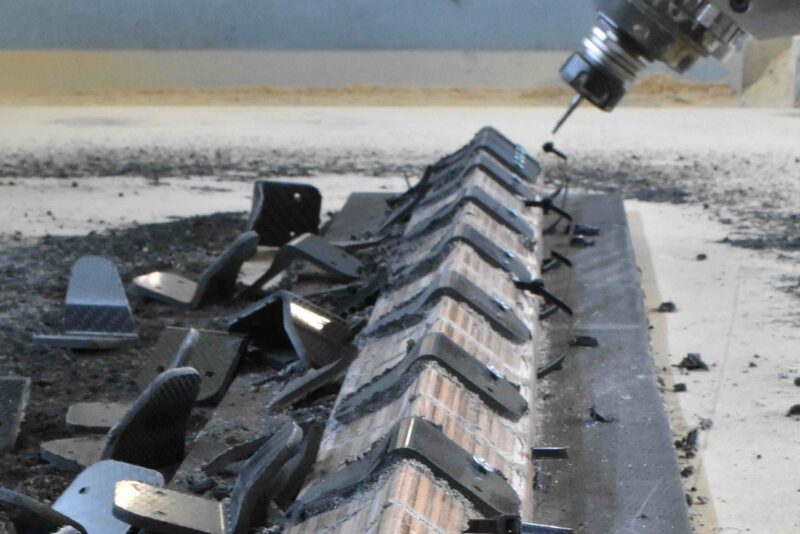 The new CNC-machined molds are made from Richlite, a countertop material composed of recycled paper and phenolic resin. 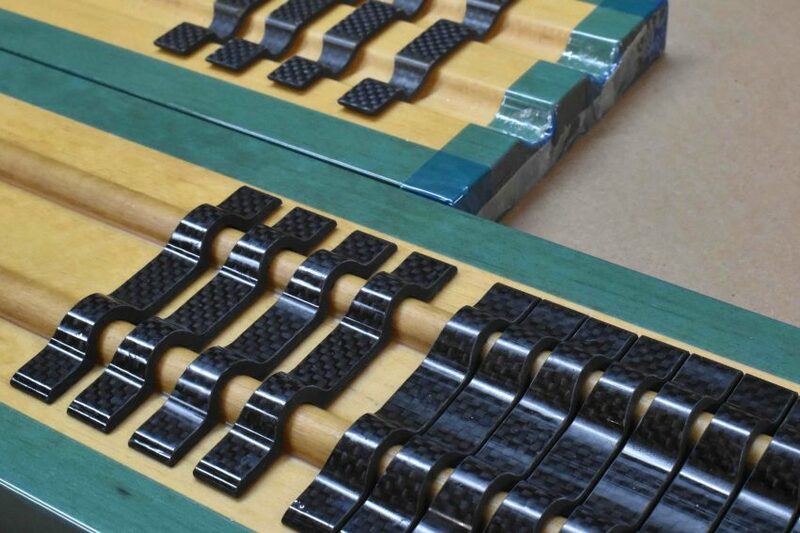 To date we have made many thousands of the carbon eye straps, most of them for deck tie points on high-end kit kayaks. The compression-molded blanks are cut to width and given a clear finish before they are cut into eye straps. While we would rather not show the cutting method we developed, finishing the blanks, cutting the parts, and rounding the edges remain labor-intensive. The alignment clip molds were originally made from plywood glued and shaped at precise angles. These molds produced many parts (220, to be exact), but the mold geometry did not yield parts with even laminate thickness, so we recently had new plywood molds CNC-machined. The choice of material can be explained by the enormous stacks of scrap plywood we had on hand. It seemed like a good recycling idea to glue them all together into one big piece to make molds. 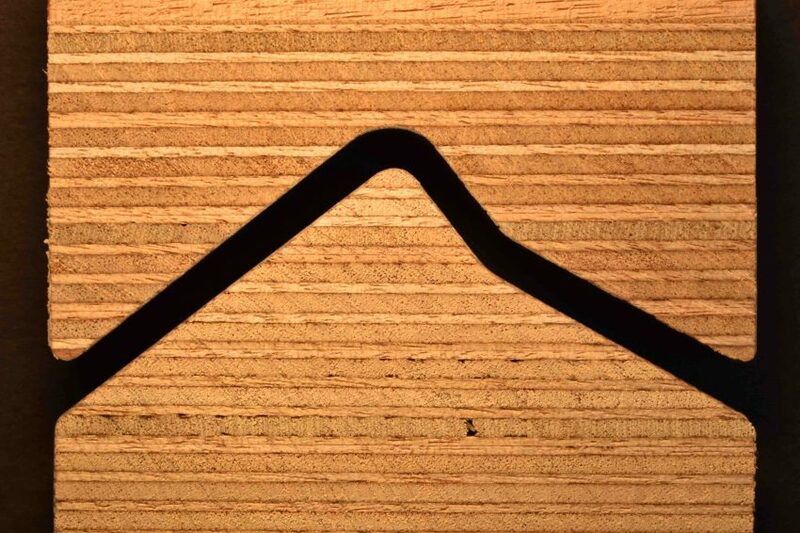 Because it is light and strong, plywood has desirable properties as a mold-making material, but it requires lots of careful work to make the surfaces smooth and tough. Other suitable material choices for CNC-machined molds are aluminum; Richlite, which can be glued into appropriate sized pieces; or high-density foam, which needs a fiberglass skin just like plywood molds do. Another interesting mold material is resin-infused MDF. Our local CNC genius, Brandon Davis, who owns Turn Point Design (see PBB No. 137, Davis’s “Skate 15” Design Brief, PBB No. 173 and Printing Small Parts), machines MDF molds slightly oversized, and then infuses them with epoxy (MDF is very porous) before machining them to their final geometry. This method produces a relatively tough, long-lasting mold surface. For the laminate of these parts, we employ heavy 19.7-oz (668-gm²) 2×2 twill carbon cloth, because using fewer layers of heavier fabric is more economical. Wetting-out the laminate stack can be done quickly, depending on resin viscosity and temperature, but we try to wet from underneath by placing each layer onto a very wet surface. 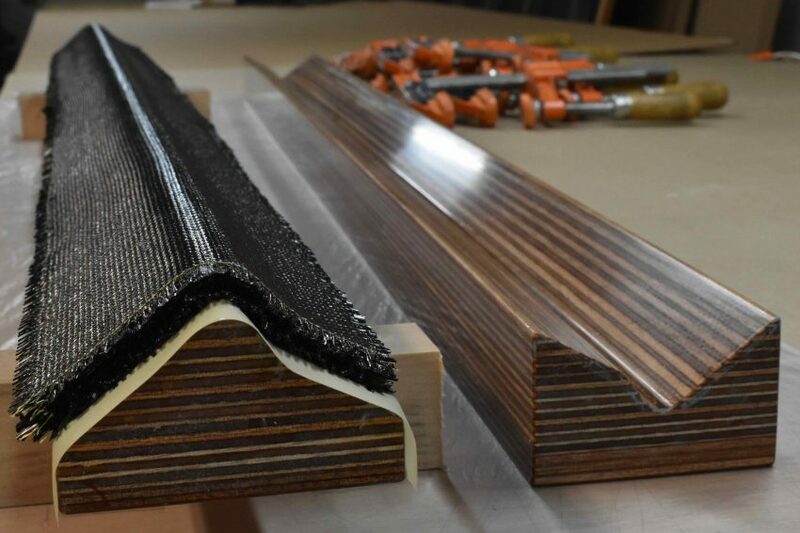 We pour a healthy bead of epoxy onto the plastic-covered table surface, roll it out evenly, and place the first layer onto the wet surface, which is rolled firmly to force the epoxy up through the weave. Then another generous bead of epoxy is added and rolled out evenly again before adding the next layer of cloth. Wetting the heavy cloth thoroughly is best done by putting each layer on a very wet surface. 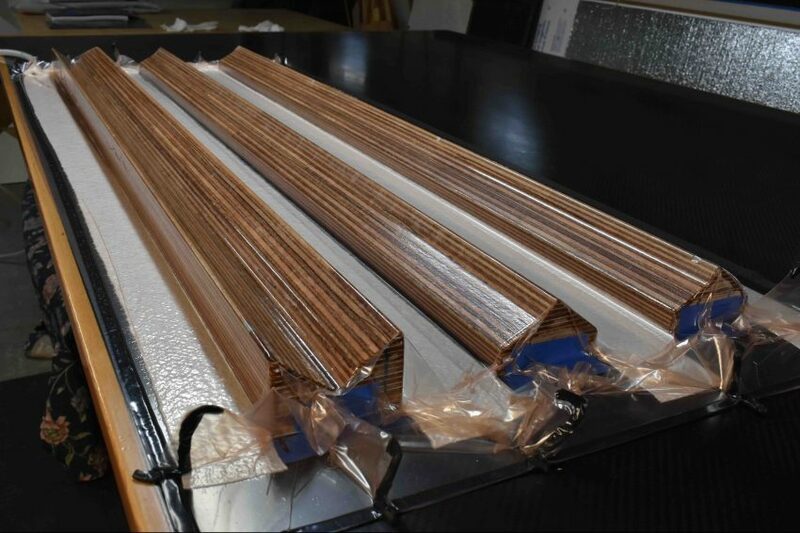 It seems that for small parts such as these, the laminate stack can be resin rich in the center of the strips and drier toward the edges, because when it’s being compressed between the molds, the epoxy moves from the center toward the edges. We use PRO-SET LAM-125/ LAM-226 for all compression-molded parts, and we often warm the laminate with a heat gun (held well away from the surface) when wetting-out the layers, which quickens saturation of the fabric. Once we determine the necessary laminate thickness, it’s easy to figure out how many layers of a specific cloth are needed. The following rule of thumb works for vacuum-bagging laminate as well as compression-molding. Woven carbon and glass fabrics are measured in ounces per square yard and in grams per square meter; 6-oz cloth is roughly 200 gm². Each 100 gm² of cloth equals 0.1mm, so five layers of 200-gm² cloth equals 1mm thickness. For the alignment clips, we needed about 4.5mm of thickness (about 3/16″). Seven layers of 668-gm² cloth equals 4,676 gm², and that’s what we got for laminate thickness—just over 4.5mm (0.18″). 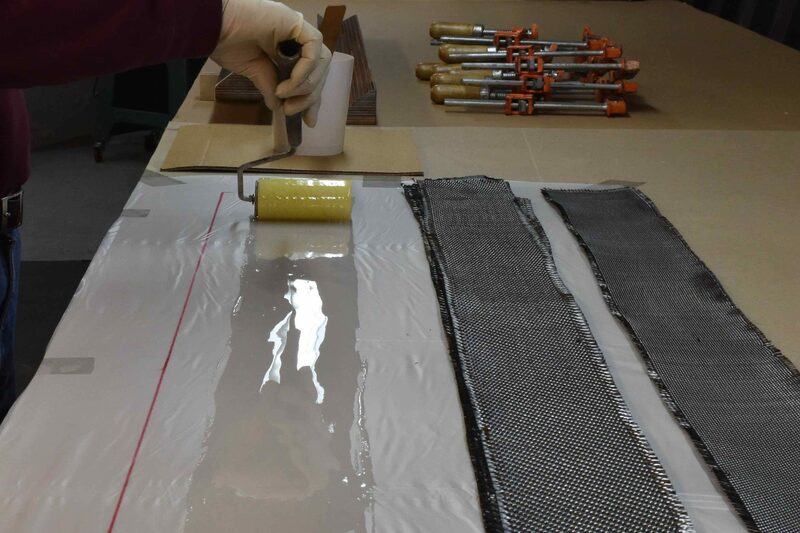 The amount of epoxy to saturate the cloth and the amount that squeezes out are worthy of study, which we haven’t done, but generally we wet the cloth as one would for wet-lam vacuum-bagging, and about 30% of what we mix (by weight) ends up being squeezed out. It seems right if epoxy starts to really pour out when the clamp pressure goes on. Sometimes there will be surface pinholes, but I have seen no evidence of air in the laminate, unlike with wet-lam vacuum-bagging. As a separating agent, we employ adhesive-backed PTFE tape (Standard Grade Tac-Tapes from Taconic), but when compression-molding these small parts, we choose a common mold-release wax instead. Epoxy should start oozing out evenly across the entire length of the mold as soon as clamping pressure is applied. We had a fixture (dummy mold) machined when the compression molds were made. The 50″-long (1.3m) blanks were strapped to the mold with cable ties fed through slots under the fixture. The cable ties held the blanks while the fastener holes were CNC-machined. Screws driven into every third clip proved to be enough to hold the blank for cutting out the individual parts. The previous 220 of these parts were cut out on the tablesaw using jigs to hold the parts while cutting. The corners were rounded on the table disc sander, and the holes were drilled on the drill press. This was scary, dirty, time-consuming, and mind-numbing. By comparison, the CNC machine cut 96 parts from four 50″ blanks in about an hour, including the time spent changing blanks. Remains of the cable ties that held the blanks while fastener holes were CNC-drilled can be seen here. Screws driven into every third clip held the blank for cutting out the individual parts. I am asked about the working load of the eye straps, which are meant as light-duty tie points only (as most eye straps are), but glue-on fittings are limited in strength by the quality of the bond and the density of the surface they are bonded to. These parts aren’t engineered in the normal way, but, instead, destructive testing is done on rejects and cutoffs. 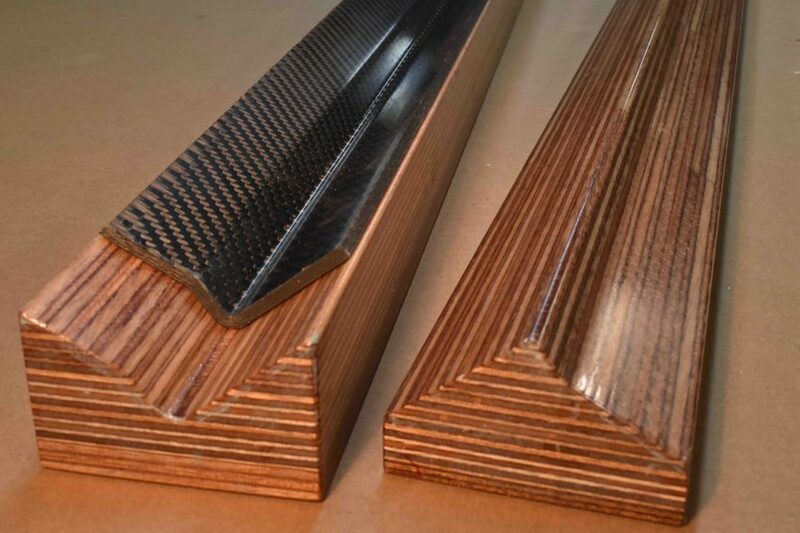 This can quickly show the strong and weak points of building parts from laminate instead of metal, which is the same strength in all directions. Because strength is mostly related to thickness, we tend to overbuild these parts. The weight penalty is negligible, so the need for exotic materials isn’t important. Prepreg and high-modulus fiber is beneficial for masts and rudderstocks, but for most hardware, not so much. 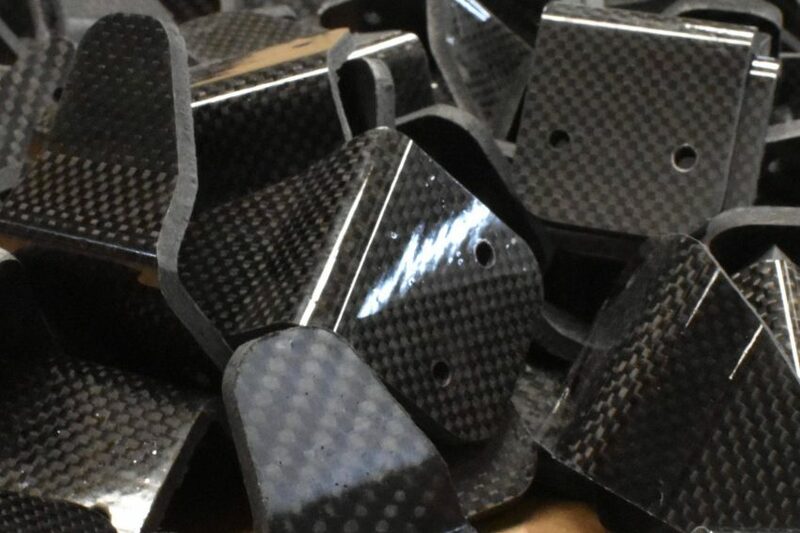 We often buy surplus or discount carbon at a very reasonable cost and are happy to avoid the high waste and cost of making parts as light as they can possibly be. 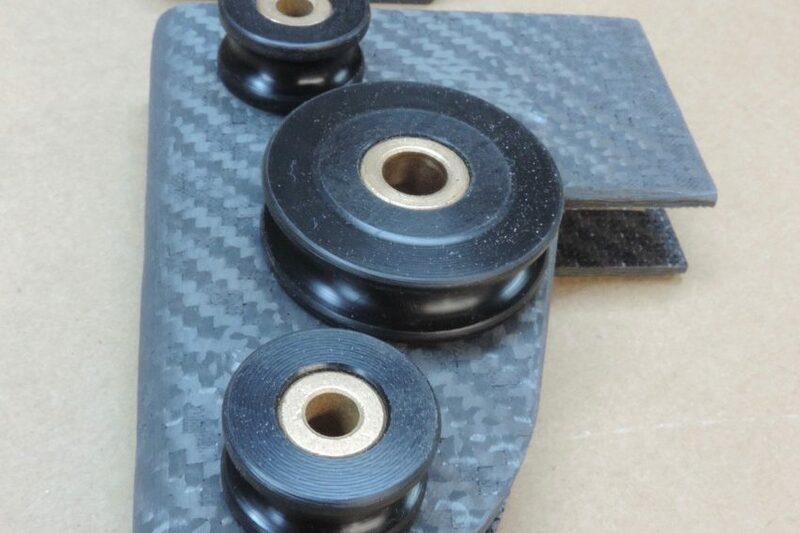 What started out as a project of necessity—building hardware for my boat—turned into a sideline that produced essential parts for my kit-boat business and a valuable learning experience about compression molding of carbon parts. You might want to try it for yourself and see what you can come up with. Brown and his wife, Ashlyn, with their G32 cat. Using many custom carbon parts on the boat, Brown set a new course record for singlehanders in the 2018 Race to Alaska. Finished clips align the two halves of the PT 11 nesting dinghy for assembly. The alignment clips were CNC-machined from long blanks. Sheave assembly for the mainsail screecher/spinnaker and a topping lift. Brown built the boxes over a male mold, and the sheaves came from Ed Louchard and Zephyrwerks (www.zephyrwerks.com). 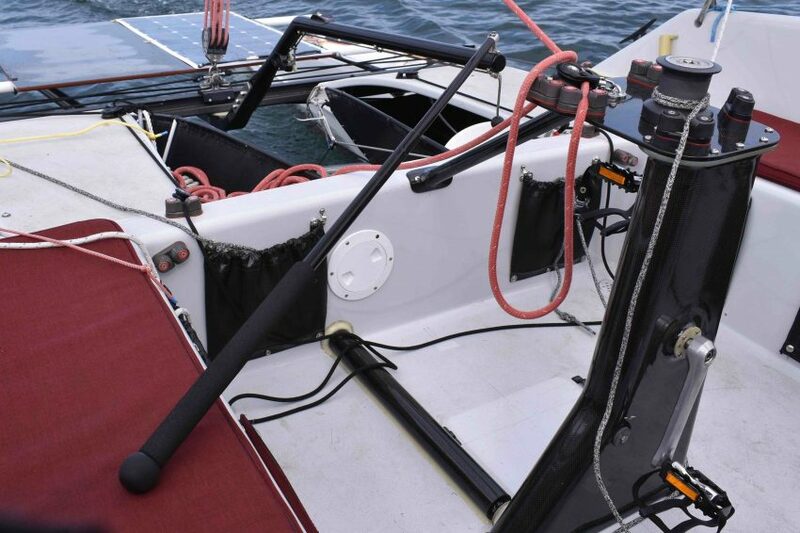 The alignment clips perform the important function of precisely joining the two halves of the nesting dinghy—especially tricky when done while afloat. Threaded pins then secure the halves together. 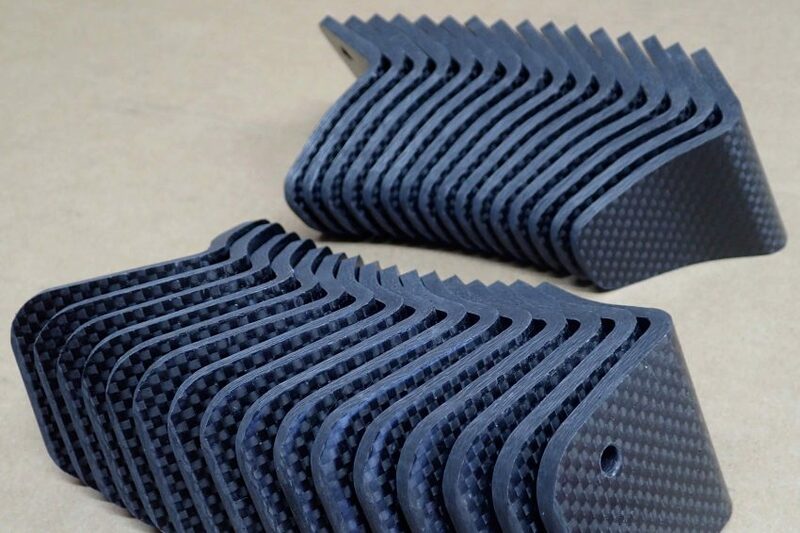 Another advantage of compression molding: finished blanks are smooth and fair on both sides. Wet laminate is shown before being clamped between the two new molds that were CNC-machined from recycled plywood. Compared to vacuum-bagging, using clamps for pressure has multiple upsides: it’s quicker, costs less, and produces less waste. 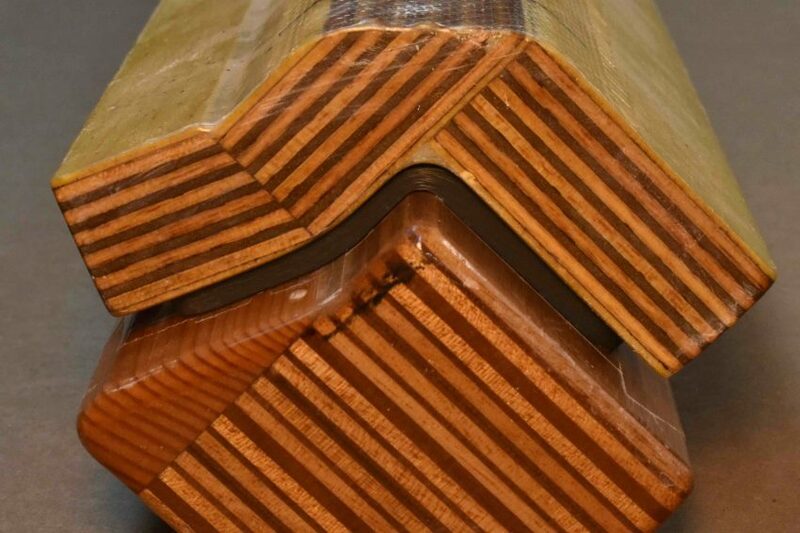 A cross section of the alignment clip molds shows the offset created by the thickness of the laminate. 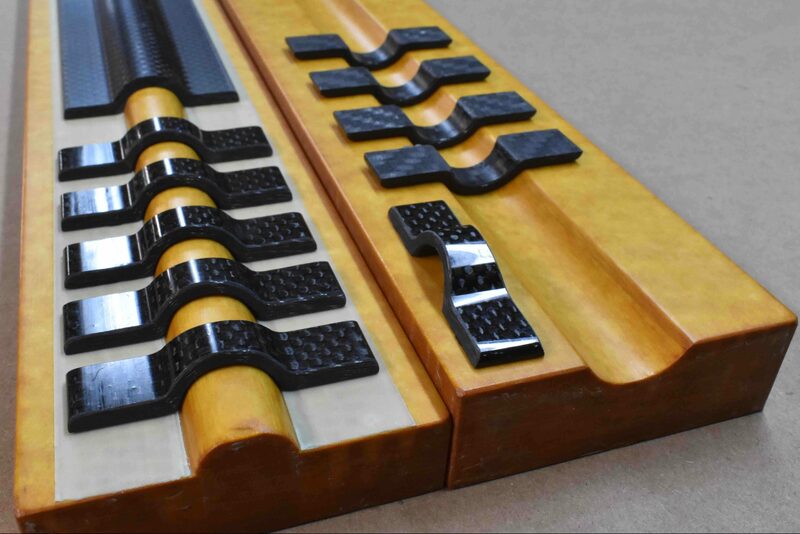 Double eye straps for routing engine-control cables previously came out of wooden molds that were f﻿inished with epoxy, while the new CNC-machined molds (shown here) are made from Richlite, a countertop material composed of recycled paper and phenolic resin. The original molds for the alignment clips were handmade from glued plywood. Plywood’s light weight and strength make it suitable for compression molds. With a vacuum-bagged f﻿iberglass skin, their surfaces are smooth and tough. Rolling f﻿irmly to force epoxy through from underneath the cloth. About 30% (by weight) of the resin ends up being squeezed out. A heap of fresh alignment clips that were molded and cut from the blank. The cockpit of Brown’s G32 catamaran features numerous samples of custom composite hardware, including the pedestal for the pedal drive. About the Author: Russell Brown wrote the definitive book Epoxy Basics and designs and builds unconventional craft, from proas to fuel-efficient motorboats. 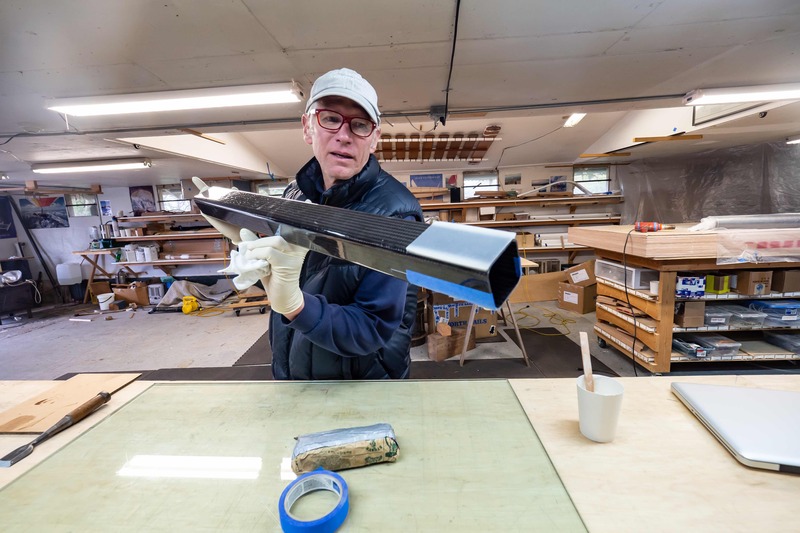 As the result of a long collaboration with Seattle yacht designer Paul Bieker, Brown also worked in the high-tech world, making custom composite parts. 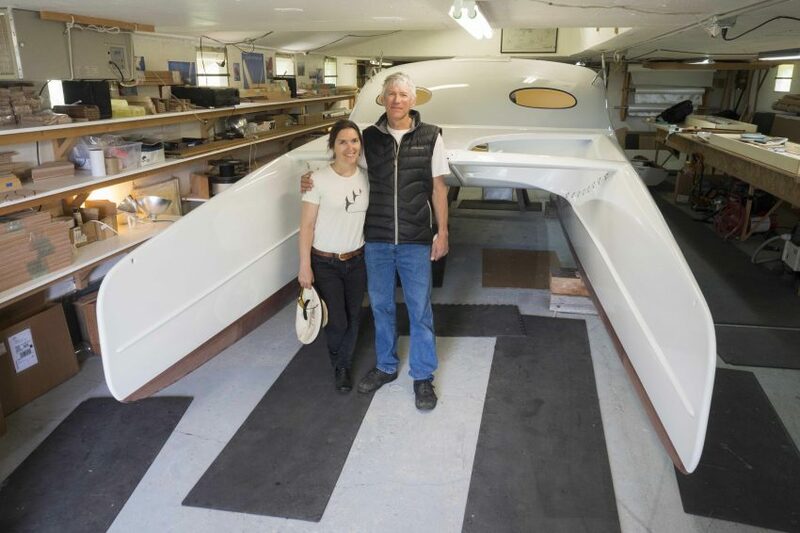 He runs Port Townsend Watercraft, a kit-boat company, with his wife, Ashlyn, while also working on boats and parts that “make sense” to him.